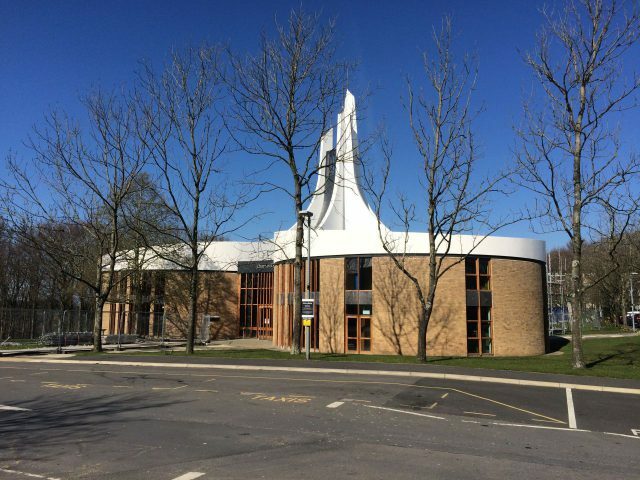 The Lancaster University Chaplaincy Building is not only the first building that greets visitors to the campus, it also amongst the most architecturally unusual with its three circular sections joined by the three-pronged spire in the centre. Moreover, the chaplaincy has also become a defining image for the University since it was used to form the basis for a new logo during its silver jubilee year in 1989. As a result, protecting the building from water ingress while respecting the aesthetic of the original structure was vital and the project called for a liquid waterproofing system that could be used on both the roof areas and the spires with colourways to match the original. As the building was to remain occupied and in use throughout the roof refurbishment, a low odour system was also critical and Sika Liquid Plastics’ virtually-odourless Decothane Ultra in White, Steel Grey answered all the specification performance criteria and offered the client a robust warranty for all aspects of the waterproofing scheme. As a liquid system, Decothane Ultra provided the ideal system for following the contours of the fascia and the spires while offering a long-term waterproofing solution. The original mineral felt roof had failed at the gutters and water outlets, causing water ingress and degradation of the insulation in these areas. Consequently, the insulation was cut out in these areas and replaced with Sika Liquid Plastics’ Decotherm insulation board. 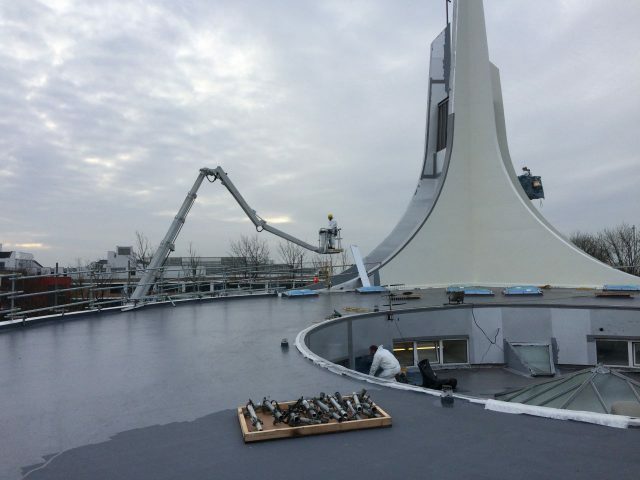 The Decothane Ultra system was installed as an overlay, with Sika Liquid Plastics’ self-adhesive vapour control layer, S-VAP 5000 installed onto the existing surfaced, followed by the two coat, low odour liquid system in steel grey to match the original colour. Each of the circular sections of the building features a fascia at high level that curves up into the centre of the building to form the spires. These areas had previously been finished with a white surface coating which had allowed damp to penetrate. The solution developed for this was to replace the existing fascia detail with a ply system and board the spires with 6mm external ply. The S-VAP 5000 system was then installed to these areas, followed by the Decothane Ultra system in white, to match the colour of the original design.